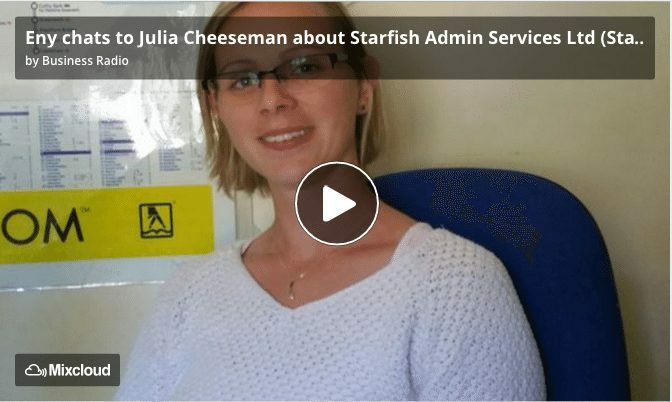 Julia founded Starfish Admin Services Ltd (Starfish) in April 2016 with the single mission to unlock time for small business owners. As a small business owner herself, she recognises that there are so many demands upon your time, often with conflicting priorities. Starfish enables you to take control and do what you love most. They provide expertise in administrative tasks such as quotations, invoicing, book keeping and diary planning through to email, social media and call management. Starfish provides these flexible solutions using local subject experts on an hourly, daily or weekly basis to suit the needs. Starfish services are here to relieve the pressure and ensure you can concentrate on what really matters, let’s leave you with a final thought:You have a very important business meeting with Richard Branson, the meeting is going well, you are all prepared and have answered all the questions he has been asking, in a moment of silence your mobile phone rings, you take a look and it is Alan Sugar ringing. You are desperate to speak with Alan Sugar but are currently in front of Richard Branson. What would you do if you missed out on two potential business opportunities? This is where starfish admin services could have supported your business. When she is not working, Julia will be found walking or cycling anywhere that’s got countryside, sailing or being by the sea. She is passionate about helping other people and loves to see the benefits of helping them. Listen to Julia tell us her journey into starting her business, her memorable moments so far and the challenges she has experienced along the way. She also has not–to-be-missed tips and advice for current, new and aspiring entrepreneurs to avoid the dangers that come with running a business. Starfish’s services relieve the pressure and ensure owners can concentrate on what really matters – running their business. Julia wants to leave you with a final thought: You have a very important business meeting with Richard Branson, the meeting is going well, you are all prepared and have answered all the questions he has been asking, in a moment of silence your mobile phone rings, you take a look and it is Alan Sugar ringing. You are desperate to speak with Alan Sugar but are currently in front of Richard Branson. What would you do if you missed out on two potential business opportunities?’ This is where Starfish Admin Services could have supported your business. When she is not working, Julia will be found walking or cycling anywhere that’s got countryside, sailing or being by the sea. She is passionate about helping other people and loves to see the benefits of her help. Listen to Julia tell us about her journey into starting the business, her memorable moments so far and the challenges she has experienced along the way. She also has not –to-be-missed tips and advice for current, new and aspiring entrepreneurs to avoid the dangers that come with running a business.